I made the second dress yesterday. And, I still think it's stinkin' cute! I put together a little tute. Feel free to email me with any questions or comments. I also started a new Flickr Pool. Please, please share your finished dresses or any other things you made using one of my tutorials. Klick here to download the Tutorial file for the dress. If you have any issues getting to the file, please let me know. 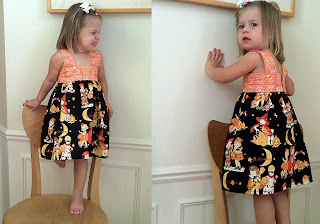 I don't normally see Halloween prints that I like all that much but the one you used for this dress is adorable! Very nice! Und gerade fällt mir auf, dass ich Englisch schreibe *grins* mit all der englischen Bloggerei geht das schon ganz automatisch! Das Kleid ist wirklich sehr hübsch und ich hoffe, viele Leute laden es runter, damit sich Deine (ich darf doch DU sagen? auf Englisch hat man dieses Problem ja nicht!) Mühe gelohnt hat! Just downloaded your tutorial (which I found through google : ) and I'm so excited about making this! It's different, simple and very cute. Thanks! I'm having a hard time downloading this tutorial. Is it still up? Thanks! I have tried without luck to download the tutorial--would you mind sending it? Thank you! It is an adorable dress and I'd love to make one. I am sorry to hear that there are so many issues donwloading the file. I have now moved it to a different server and hope that fixes the problem. Please try the link above. If it still doesn't work, please let me know via email and I will send to you. Kit, please contact me via email if you still have issues. Unfortunately, I have no way of contacting you right now. I am having a hard time downloading the jumper dress. It doesn't work for me when I et to terra depot. the link for the tute will take you to Easy Share. The download should be working now. If you are still experiencing problems please send me an email and I will send you the file directly. I finally got around to using this tutorial! I knew I would eventually...I blogged about it today if you want to check it out: www.smalltownstitcher.blogspot.com I'm also adding the pics to the flickr pool. THANKS!!! !